First it was Richard Danzig, a former Navy Secretary in the Bill Clinton administration; currently he is being tipped to be the new National Security Adviser if Barack Obama wins the White House race, who raised the topic of Winnie-the Pooh being a fundamental text on national security. Now the police in Japan have reported that a 20 year old man belonging to Tokyo named Masayuki Ishikawa has probably taken a leaf out of Richard Danzig and taken advantage of Winnie the Pooh image and tarnished it. Masayuki Ishikawa dressed up as Winnie the Pooh apparently because he had ran out of clean clothes. Masayuki Ishikawa flanked by his two friend one dressed as a mouse and the other as a panther were standing on a Tokyo street corner when 2 pass biers started staring at them and Masayuki Ishikawa dressed as Winnie the Pooh robbed the 2 people of $160 just because they stared at him. The Tokyo police arrested him and his friends for this offense. 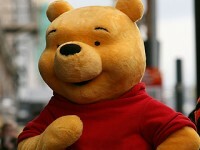 Such incidents are few and far but still do tarnish the impeccable image and reputation that people all over the world have associated with Winnie the Pooh for decades now.